Knox County's festival shows why Hoosiers crave this summertime treat. You won’t find a juicier watermelon anywhere other than Knox County. The rural southwestern Indiana county produces 70 percent of all watermelons in both Indiana and Illinois. Hoosiers are so fond of watermelon that Vincennes hosts an annual watermelon festival each August. The town uses approximately 400 to 475 watermelons for the event, and between 8,000 and 10,000 guests attend every summer. This year marks the 22nd festival. The southwest corner of Knox County is a peninsula formed by the White and Wabash rivers, which creates land great for produce. “Our ground is sandy, which is ideal for growing watermelon,” says Mark McNeece, president of the Knox County Chamber of Commerce. “A watermelon loves water, but doesn’t like to lie in it.” Farmers pump water directly onto the watermelon so the roots can soak up the moisture. Any excess water drains through the sandy soil. 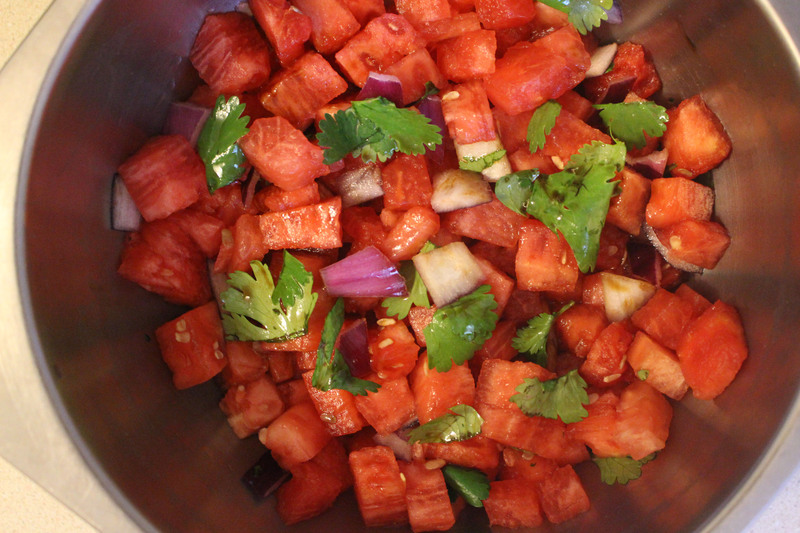 Aside from the traditional slice of watermelon, watermelon salsa is another popular food at the festival. It’s sweet, savory, crunchy and easy to make. Visitors can pick up a recipe for the snack from vendors there. -Halve the watermelon and scoop out meat. -Seed and cut up into smaller pieces. -Save some watermelon juice and one of the halves for serving the salsa in. -Chop the cilantro and onion. -Gently mix everything together (including balsamic vinegar and excess juice) in a large bowl or container. -Depending on the watermelon’s size, use more or less balsamic vinegar and watermelon juice for taste. -Chill. Serve in a watermelon shell as a side dish or salad.